I've said a number of times now that Adam Roberts is a gifted author and this is increasingly evident with each new book he writes. His work overflows with ideas and at the same time he seems to delight in using different structures, to experiment in forming his narrative. This time he's turned his attention to the Fermi Paradox, told through the workings of Kant along with that classic tale by John Carpenter — The Thing, and a host of other ideas. It begins on an Antarctic research base that is manned by two scientists. Charles Gardner is practical, easy-going, friendly even, while Roy Curtius is surly, secretive and obsessed with reading the works of the philosopher Kant. Over the months they debate Kant, reality and the possibility of an empty Universe. They begin to despise each other and then learn that they may not actually be alone. So for those who don't know, Kant was an 18th century German philosopher whose works are often considered the cornerstone of modern philosophy. Kant argued that concepts of the mind structure experience, that reason is the source of morality. He also argued that space and time are forms of our understanding and as such anything that dwells "within" the Universe we know can never tuly understand it. The Sun is a fairly typical star, of which there are many billions in the galaxy, many much older than our own star. Many of these stars will have Earth-like planets and if the Earth isn't a fluke, some of these should develop life. of those some may develop intelligent life. Some of these planets with intelligent life might develop interstellar travel. Even at a slow pace our entire galaxy could be traversed in a million years or so. According to these points, our planet should have been visited by now. However there appears to be no hard evidence of any such visit — if you discount the many, many sightings of UFO's and transcripts of people who believe they have seen such things, that is. If we discount these accounts, where are all the aliens? There have been no decisive argument provided to prove or diss-prove the Fermi Paradox. Robert argues that if Kant is right and we can never really understand the Universe because we are a part of it, then only an intelligence that isn't human could ever hope to provide some understanding. Artificial Intelligence could prove the answer, should a sufficiently advanced intelligence ever be created. The story itself is only related to John Carpenters work on a surface level, although there is a persistant feel of horror that mirror's that classic. Charles makes a wonderfully inept antagonist, completely out of his depth, fumbling along from one misshap to the next — along with a generous dose of self-pity over his disfigurements brought about due to events at the beginning of the book. 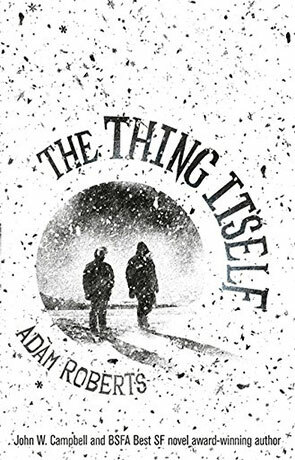 Roberts uses a number of different narrative styles during the course of the story with a few interludes from other places and times — travelling from the arctic base, back to the turn of the 20th century then forward to an older Charles and at one point jumping into a far future where it's fashionable to catch old-fashioned illnesses just to experience them. There are also a number of published sources used through the book — I especially loved the nod to Will Wiles "Way Inn". Like most of Robert's novels, The Thing Itself is a book you need to take your time with, it has so many ideas, written in so many different ways that it would be quite easy to lose your way should your attention falter for just one moment. It is also however a masterpiece of science fiction, the writing is superb and the ideas simply inspired. Once again Robert's has surpassed himself. Written on 8th January 2016 by Ant.